Visitors to the Aquarium can often spot educators throughout the building toting a biofact — like a shark jaw, shark skin or a whale vertebra. Our educators are always poised to answer questions, and they might even teach you something new about our aquatic world. Educators often carry curious aquatic biofacts. Try to stump them with your questions! Let's take a moment to talk about one of these special teaching tools: The whale vertebral disk. 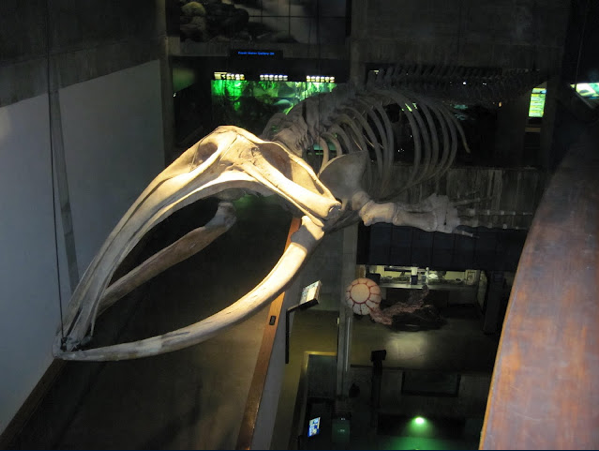 It probably came from a large baleen whale, up to 55 feet long. The giant bone was brought up by fishermen trawling for scallops on Stellwagen Bank in the late 1960s (before the Marine Mammal Protection Act of 1972). It is very similar to the disks between the vertebrae of a human spine, although whale bones are more porous and, of course, considerably larger! When the whale was alive, the holes were filled with oil, which helps with buoyancy. Being more buoyant helps the whale reach the surface to breathe. After hearing the history of this bone, many people ask about trawling. Bottom trawling involves dragging large, heavy nets along the sea floor. Large metal plates and rubber wheels attached to these nets move along the bottom and can capture or crush nearly everything in their path. The nets can also level the structure of the bottom, destroying important habitats for benthic (or bottom-dwelling) organisms. This had been compared to clear-cutting a forest. 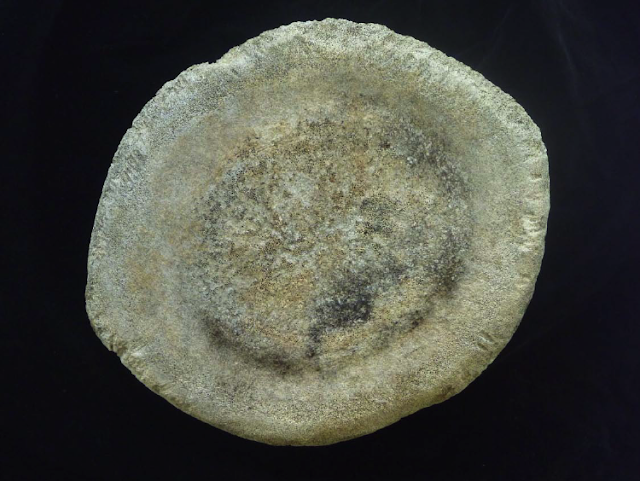 This whale disk was part of that benthic structure and may have provided shelter for other animals. When it was pulled up in the fishermen’s net, it was covered with algae, barnacles and other small animals. Currently, fishermen are experimenting with new methods of trawling that should help to prevent benthic degradation and avoid bycatch. In fact, the Aquarium is working with fishermen, engineers and marine biologists to research and develop fishing techniques that reduce bycatch of endangered non-target marine species. Learn more about these efforts on our Conservation and Research pages. The next time you're at the Aquarium, keep an eye out for an educator with this important biofact. Try looking up, too. Check out the right whale skeleton hanging from the ceiling. Can you find the vertebrae? How many are there? How many do you think people have? You never know what you're going to learn during a trip to the Aquarium, or a troll around our blogs. Mystery Shark Egg Part II — It's a girl!